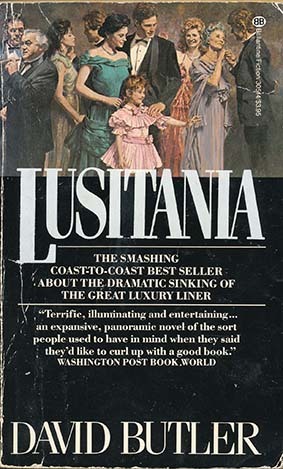 “LUSITANIA” By David Butler. (Fiction) A fact-based novel dealing with the sinking of the famous British passenger liner, RMS Lusitania. In May of 1915, Commander Walther Schwieger’s U-20 stumbles upon the Lusitania and sinks the massive liner with a perfect torpedo shot. The vessel sank within 18 minutes causing a great loss of lives, the tragic event sends the American’s into World War I. Author David Butler brilliantly creates a cast of characters aboard the doomed liner for his exciting novel. 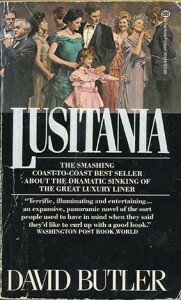 1983 Paperback edition. 755 pages, no photos or index.